This route is a fun alternative to the standard south slopes which involves a beautiful, solid ridge scramble with a few sections of low 5th class climbing making a rope advised if your party is planning to do the direct ridge route. There is a bypass route which allows you to skip the upper 5th class step keeping the entire route at sustained 4th class, therefore making a rope unnecessary for experienced climbers however many people will probably want some protection throughout the route as the exposure is quite relentless much of the way. It's best to climb this route from July through early fall when it is dry. If you find yourself in this area in early season, try the Dark Moon Couloir which is an awesome snow climb located just to the left of the ridge. In fact, this couloir is visible most of the way up the ridge! Rock Creek Trailhead – From the Montana Road 308 and US Highway 212 junction in Red Lodge, go west on US 212 for 11.4 miles and turn right onto FS 2421 (Rock Creek Road) and measure from this point. Follow this paved road for 0.9 miles where it turns to dirt and passing by three National Forest campgrounds. Here the road forks, take the left fork and continue on the good dirt road and pass the M-K Campground at mile 2.8. Here the road becomes rougher. Continue 8 miles on this road as it drops into Wyoming and reaches the trailhead at the Montana/Wyoming state boundary at 8,700 feet. This road is passable for tough passenger cars with good ground clearance. There are many good places to pull off and camp on either side of the road. Approach - This is one of the shortest approaches to any 12,000 foot peak in the Beartooth Mountains. From the Rock Creek trailhead, begin up the steep switch-backing trail through an old burn area and reach a nice footbridge crossing Rock Creek after 0.6 mile at 9,080 feet. Cross the bridge and continue up the trail for eight more switchbacks and locate a side trail heading off to the right (north) at 9,230 feet, a quarter mile from the bridge. There may be a cairn here to mark the turnoff. Follow this steep but well traveled boot path along the left(west) side of Rock Creek for 0.35 mile to where it crosses back to the east side of the creek on large boulders at 9,600 feet. Past this crossing, the slope eases and the path continues through open grass above and on the right side of the creek. At 9,850 feet cross the creek back to its left side right below a small tarn and continue up the trail through meadows, passing another small tarn a few minutes later. Just above this second tarn, cross the creek again and follow a small creek which drains Shelf Lake and arrive at the shore of Shelf Lake at 10,200 feet. There is great camping along Shelf Lake but you can continue northwest over a large, broad grassy bench for 1.2 miles to the southeast corner of Moon Lake. This hike is beautiful and the lupines are everywhere in July and August. Awesome camping can also be found all around the south shore of Moon Lake. From the southeast corner of Moon Lake, walk around its east shore and follow grassy meadows and reach the start of a series of talus moraines after about a mile. 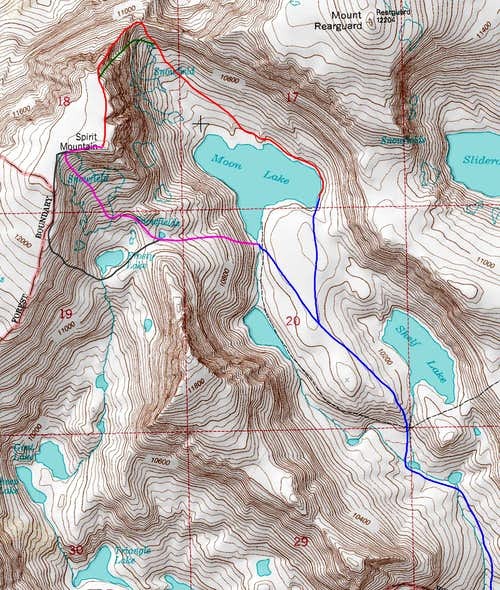 Route-find your way northwestward through very loose talus and boulders to where the terrain steepens at 10,750 feet. Climb moderate snow or scree for about 500 feet to the 11,220 foot saddle right at the base of the northeast ridge which is about 1.3 miles from the south side of Moon Lake. Begin up the ridge on ledges to the right (north) side of the crest and scramble 100 feet up and re-gain the crest (Class 3). Climb on the crest now or just to its south a short ways and up a 50 foot grassy gully to the base of a small face with a series of cracks splitting it. The steep, Dark Moon Couloir is to the left and a small tower can be seen above just across it. Continue around the right side of this face and climb 100 feet up a heavily cracked slab with plentiful holds and solid rock but intense exposure to the right (Class 4). Above, the terrain eases where you can continue to the left up lower angle slabs back to the ridge crest where there is a small flat bench offering a great place to rest around 11,550 feet. Views down to Black Canyon Lake are impressive. Climb up a 10 foot slab on the crest and continue right and traverse an exposed 5 foot wide ledge and either climb a 30 foot nearly vertical but solid dihedral (Class 5.2) or keep traversing the ledge, passing a narrow constriction (exposed) and ascending easier terrain back to the ridge above the dihedral (Class 3). Continue 60 feet up the ridge on Class 2 terrain to where the ridge narrows considerably about 500 feet below the summit plateau. You are now just above the small tower across the Dark Moon Couloir. From here forward progress looks daunting but traverse left on the south side of the ridge on a series of ledges staying generally at the same elevation. These ledges traverse below a few small towers that don't make much sense to traverse over. Continue traversing the ledges to the Dark Moon Couloir but don't enter it and climb 150 feet of sustained Class 4 terrain on relatively solid and blocky terrain to the right of the couloir. The exposure here is relentless and a fall will send you 1,000 feet down the 45-50 degree couloir. When you notice a large step in the ridge crest that appears to be a large gendarme (which it isn't), climb 100 more feet back to the ridge crest and gain it at the base of a ~100 foot step above the small towers you traversed around. Climb this 65-70 degree step on beautifully solid rock utilizing large cracks and blocks (Class 5.4). Belay off a large rock atop the step and scramble the remaining easy ridge to the summit plateau which is only a few minutes from the top of the step. Once on the plateau, turn left and walk easy terrain for 0.3 miles to the high point on the southeast corner. Be sure to look down the very steep east face along the way! Instead of climbing back to the ridge crest at the base of the 100 foot step, continue climbing Class 4 blocky terrain just right of the couloir. The higher you go though the worse the rock gets. When you are about 100 feet below the plateau, the terrain eases to class 3 but the rock becomes terrible and you will have to enter the couloir or cross it at some point just below its end. There are many ways to finish the last 50 feet all of which involve very loose rock and scree. Bypassing the upper ridge step keeps the whole route at class 4 but you miss the fun and solid technical pitch. If you have the experience and gear it's advised you complete the ridge to avoid loose rock. Bring a 50 meter alpine rope, a small rack to 2 inches, and if you plan to descend the south slopes snowfield also have ice axes and possibly crampons. If you descend the south ridge and drop to Frosty Lake you can void the snow gear assuming it is mid-July or later.